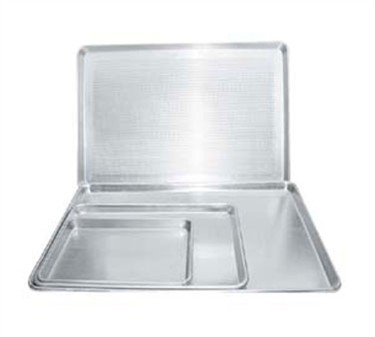 Essential in bakeries, cafes and restaurants, the Winco ALXP-1318 Aluminum Half Size Sheet Pan, 13" x 18" is sturdy bakeware that can serve multiple baking purposes. Use for baking cookies, warming buns, or broiling food, this sheet pan, made of 3003 aluminum, will provide consistently baked results every time. Featuring a closed bead with galvanized wire rim that resists warping and bending, this rust-resistant baking sheet will last for years in your commercial kitchen.